markbglife September 30, 2011 Labyrinth: The War on Terror 2001-? In the immediate aftermath of the 9/11/2001 terrorist attacks, western intelligence agencies received incontrovertible evidence of a WMD plot, in the final stages of planning, inside the United States. This variant scenario for “Labyrinth: The War on Terror 2001-?” places additional emphasis on the intelligence aspects of the current war on global terrorism. It shifts some of the focus away from the critical Oil Resource countries, forces America to stretch its limited capabilities to the maximum, and requires both players to adjust their overall strategies. Any country on the entire map could hold the key to victory or defeat. The modifications to the victory conditions were deliberately designed to be quite challenging for the U.S. player. I created this scenario because it is my opinion that, given equally experienced Labyrinth opponents, the U.S. player will always win the “Let’s Roll” scenario, barring an extreme run of bad luck in card draws and dice rolling. This may just be a healthy dose of reality, given the vast military and economic resources of America vs. those of the Jihadists. But Labyrinth is NOT reality; it’s just a game. The intention of saddling the U.S. player with additional victory requirements is to make it a more challenging game. After having done some additional play testing (and taking abuse from my fellow gamers for making the burden too onerous for the US player), I’ve made a minor concession and adjusted the Discovery rules a tiny bit. Now a modified die roll of only3 is required for successful Discovery versus 5 in the original rules. I still find this scenario to be “winnable” for the US player, but very difficult by design, so the remainder of the rules remain intact. Download PDF of scenario instructions. Also, you can download a JPG image of the new unit counters here. New units are required to play Intel Wars. There are 5 CIA Units that represent the collective intelligence effort of America and its allies, and 59 Intel Chits of various types. Some of these chits contain critical objectives for the U.S. player (i.e. Usama bin Laden, WMD Plots, etc), some give intelligence “hints” (called Location Chits) and some are just dead ends. The scenario PDF (or the JPG if you prefer) contains all the graphics needed to create the unit counters, front and back. Bin Laden – High Value Target Chit – Represents the physical location of Usama Bin Laden. Zawahiri – High Value Target Chit – Represents the physical location of Ayman al Zawahiri. WMD Plots – High Value Target Chits – There are 2 WMD Plot Chits (WMD Plot A and WMD Plot B) that represent the intel necessary to thwart the planned WMD attack on the U.S. The U.S. player must successfully Discover both of these chits by the end of the game in order to foil the plot. Doublecross Chits – An exceptional counterintelligence effort by the Jihadists to lure the CIA into a trap, causing the elimination of one CIA unit. There are 3 Doublecross chits. Prestige Chits – Provide either a +1 or -1 Prestige upon Discovery. There are 6 Prestige Chits, 3 with +1 and 3 with -1 Prestige modifiers. “False Lead” and “Bad Intel” Chits – No action; just a wasted effort by the CIA. There are 13 of these chits. First, the Bin Laden and Zawahiri chits must be placed. Next, both WMD plot chits (Plot A & Plot B) must be placed. Next, all 3 Doublecross chits must be placed. Next, the 6 Prestige Chits are placed. Next, exactly 10 Location chits must be placed, but only ONE of them may be False. The rest must all be True, based on the chosen locations for Bin Laden, Zawahiri and WMD Plot chits. (see “Location Chits”, below, for more information on Location Chits). 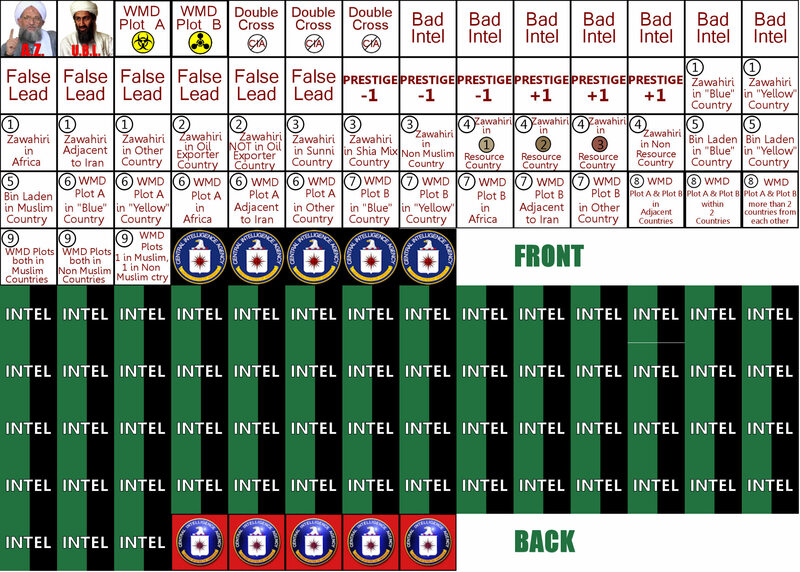 Finally, the 13 “False Lead” and “Bad Intel” Chits are placed in all the remaining countries. Location Chits are organized in 9 groups. Each Location Chit has the group number circled in the upper left corner. Within each numbered group, only one chit can be True. So, the Jihadist must pick one True chit from each of the 9 groups, based on the chosen locations for Bin Laden, Zawahiri, WMD Plot A and WMD Plot B. Then, a 10th chit should be selected, from any of the 9 groups. This 10th Chit will be FALSE and is used to mislead the U.S. player, should he Discover it. The U.S. starts the game with five (5) CIA Units on the Troop Track (it doesn’t matter which box of the Track). The purpose of these units is to reveal Intel Chits. They may move from the Troop Track to a country, or from country to country, expending Ops points to do so, and attempt to Discover any hidden Intel Chits. Only 3 CIA units may be on the map at one time. CIA placement/movement may is initiated by play of CARD 2 during the U.S. Action Phase. To move a CIA unit from the Troop Track to the map, or from one location on the map to another, the U.S. player must spend 1 Ops point. Therefore, play of a 3-Ops card would allow placement/movement of 3 CIA units. An ops card can be used either place/move a CIA unit, or for normal U.S. operations; it cannot be used for both. To move or place a CIA unit, simply move it from its current location to another country anywhere on the map, except for the U.S. and Iran. Note that CIA units do NOT trigger “testing” of any countries. Only three (3) CIA units may be deployed on the map at any given moment. Any CIA Units remaining on the Troop Track may only be placed on the map if/when a currently deployed CIA unit is eliminated. Such replacement units deploy from the Troop Track to any country, after the second card play of the next U.S. Action Phase, paying 1 Ops point per unit as specified above. There may be more than one CIA unit in a country, if desired. The purpose of only allowing CIA placement or movement during the second card play is to prevent the units from being used for Discovery (see below) in the same Action Phase they move. The Jihadist will always have an opportunity to respond to the movement of a CIA unit before the CIA unit can attempt Discovery. +2 if current “Regime Change” country. +1 for each additional CIA Unit in the country. +1 if one or more US Troops in the country. +1 if “Ally” Muslim country (NOT cumulative with “Regime Change” modifier). +1 if “Blue” country with Posture same as U.S.
-1 if one or more Jihadist Cells in the country. -1 if “Adversary” Muslim country (NOT cumulative with “Islamist Rule” modifier). -1 if “Yellow” country with Posture opposite of U.S.
-2 if “Islamist Rule” country. For any other conditions and circumstances (including un-tested countries), apply no modifiers at all. If the negative modifiers in a country make it impossible to successfully “Discover”, then the American player will have to perform the operations necessary to rectify the situation. For example, the U.S. player may have to move multiple CIA Units into an Adversary Muslim country with Cells to neutralize the -2 modifier. Likewise, an Islamist Rule country might require the presence of 2 or 3 CIA units to neutralize the negative modifiers, or may even require a Regime Change operation. When the “Bin Laden” or “Zawahiri” Intel Chits are successfully Discovered, the U.S. player may immediately select and reveal two other Intel Chits in any country on the map that is NOT an Islamist Rule country (that’s two free Discoveries for Bin Laden and another two for Zawahiri). No CIA Units need be present in these countries; it’s totally free. This simulates the effect of intelligence that might be gleaned from the capture of either of these guys. In addition, U.S. Prestige is immediately increased +3 when Zawahiri is Discovered and +5 when Bin Laden is Discovered. CIA Units may be eliminated. However, the U.S. player’s very last CIA Unit is immune from elimination, so they will always have at least one CIA unit in play. If CIA Units Discover a Doublecross Intel Chit, one CIA unit in that country is immediately eliminated. One CIA Unit that is present in a country when it changes to “Adversary” or “Islamist Rule” is immediately eliminated. An Unblocked WMD Plot in a country will immediately eliminate one CIA unit in that country (if any are present). As CIA Units are eliminated, new CIA Units may be moved from the Troop Track as stated in the “Placement/Movement” rules, above, as long as there are still CIA Units remaining on the Troop Track. Remember that the maximum number of CIA Units deployed to countries on the map at any one time is 3. The setup for the “Let’s Roll” scenario should be used, with the addition of 5 CIA Units being added to the Troop Track (anywhere on the Troop Track is fine), and the placement of the “Intel Chits”, as instructed in the “Placing Intel Chits” section, above. Play the game as usual, except the U.S. Action Phase is amended to add steps for “Discovery” and “Placement/Movement” of CIA units. For example, the American plays CARD 1. Next, eligible CIA units may attempt “Discovery” rolls. Next, CARD 2 may be played as a standard operation or may be used to Place/Move a number of CIA Units equal to the Ops Point value of the card. NOTE: If the U.S. player only has 1 card at the start of his Action Phase, first “Discovery” is conducted, then the card is played, and finally “Placement/Movement” is conducted. In this case only a single card can function as both “CARD 1” and “CARD 2” for purposes of the modified Action Phase sequence. The US Player receives no Prestige award for Disrupting Jihadist Cells. For all situations mentioned in this scenario that require play of a 3 Ops card, Reserves may be used. Victory conditions are slightly modified (see “Victory Condition Modifications”, below). Intel Wars was intended to be played as a “1 Deck” game, although it may be extended to “2 Decks” to lessen the pressure on the U.S. player, if desired. If the U.S. player does not Discover both the “WMD Plot A” and “WMD Plot B” Intel Chits by the end of the game, the Jihadist player wins. If the U.S. achieves any of its standard instant victory conditions, but has not yet Discovered the WMD Plots, play may continue. However, the U.S. must meet ALL victory conditions at the instant of determination. So, for example, if the U.S. eliminates all Jihadist Cells from the map, but has not yet discovered the WMD Plots, play continues. Later, when the U.S. discovers the WMD Plots, the other standard victory conditions must still be true at that moment in order to declare a win. Note that only one chit from each group can be True. * Zawahiri in a “Blue” country (UK, Canada, Schengen, Serbia, Israel, India). * Zawahiri in a “Yellow” country (Russia, Caucasus, China, Thailand, Philippines, Kenya/Tanzania). * Zawahiri adjacent to Iran. * Zawahiri in “Other” country (Lebanon, Syria, Jordan, Saudi Arabia, Yemen or Indonesia/Malaysia). * Zawahiri in Oil Exporter country. * Zawahiri not in Oil Exporter country. * Zawahiri in Sunni country. * Zawahiri in Shia-Mix country. * Zawahiri in Non-Muslim country. * Zawahiri in “1” Resource country. * Zawahiri in “2” Resource country. * Zawahiri in “3” Resource country. * Zawahiri in Non-Resource country. * Bin Laden in “Blue” country. * Bin Laden in “Yellow” country. * Bin Laden in Muslim Country. * WMD Plot A in a “Blue” country. * WMD Plot A in a “Yellow” country. * WMD Plot A in Africa. * WMD Plot A adjacent to Iran. * WMD Plot A in “Other” country. * WMD Plot B in a “Blue” country. * WMD Plot B in a “Yellow” country. * WMD Plot B in Africa. * WMD Plot B adjacent to Iran. * WMD Plot B in “Other” country. * WMD Plots 2 countries away from each other. * WMD Plots more than 2 countries away from each other. * WMD Plots both in Muslim countries. * WMD Plots both in Non-Muslim countries. * One WMD Plot in Muslim country; the other in Non-Muslim country. The variants presented in the “Intel Wars” scenario totally change the complexion of the game. Countries and regions that are normally back-waters, like most of Africa, Syria, Turkey, Jordan, Israel, Thailand, etc., suddenly take on new significance. The U.S. player is no longer free to hyper-focus on Saudi Arabia, Gulf States, Pakistan and Iraq, while waiting for the inevitable “Oil Price Spike” card to appear and give him the game. Without discovery of both WMD Plot chits, the win will go to the Jihadist, so America may need to visit every corner of the globe to neutralize them. A common American strategy is to NOT try for Regime Change in Afgahnistan, as the potential Prestige blowback may cripple the war effort. But what if the Jihadist hides WMD Plot A in Afghanistan and then loads it up with Cells? At some point, the U.S. may be compelled to launch a Regime Change operation there to score the mandatory Discovery of the Plot. Since the US Player does NOT receive Prestige boost for Disrupting Cells, locating Bin Laden and Zawahiri may be the quickest way to get a badly needed Prestige boost. So a U.S. plan to ignore the Intelligence facets of the game until later may have to be adjusted. Other, Intel-specific, strategies also come to mind. For example, Jihadist placement of a WMD Plot chit, and 3 DoubleCross chits in Saudi Arabia, Gulf States, Pakistan and Iraq, can thin out CIA units pretty quickly, if the U.S. player is unlucky. The majority of the scenario’s stress is placed on the American player. This leaves the Jihadist player free to pursue the victory that always seems just out of reach in the standard game. However, the Jihadist will have some stressful moments trying to preserve the advantages inherent in “Intel Wars”. For example, he may occasionally have to rush some cells to a country in order to prevent the U.S. from making a major “Discovery” there (remember that the presence of Cells makes U.S. Discovery more difficult). Enjoy exploring this new scenario and please feel free to share your experiences (positive or negative) with me. This is a great game and I think we’re only scratching the surface of possible game system expansions. Hoping to see some “official” expansions or variants from GMT in the future. Posted in Labyrinth: The War on Terror 2001-?. Bookmark the permalink.